As a Golf Club, we offer a unique opportunity for your guests to take part in putting and chipping activities on our putting green and driving range. We also have Corn Hole, an addictive lawn game that can be played both inside and outside. We will work with you to tailor a package to suit guests, that will ensure everyone has a fun experience, from the novice who has never played to the seasoned professional. Activities can be arranged to fit your group size and timings of your day. Getting out into the fresh air is a great way to break up a training day, workshop or meeting. Guests come back into the clubhouse feeling refreshed and revitalised. Spend some time on our natural grass putting green. Go around once, twice, three times or even keep going. We will set up a putting course as challenging as you wish. Be nice or be mean - its your call! If you would like to run a competition we can even set up a score card with your corporate logo on it to use for prize giving. Hit/chip golf balls to targets set up on the practice fairway - Keep score or just have fun, the choice is yours. Great for those that wish to compete against each other for the honour and glory as well as those that just want to have a go for fun. Don't worry if you have not played golf before because the distances are obtainable for all involved and are both entertaining and challenging. Corn hole is an addictive lawn game that can be played both inside our venue and outside if weather permits. A simple game in which players take turns throwing bags of dried corn onto a raised platform with a hole in the far end. Points are scored for landing on the board and bonus points for getting the bag into the hole. "a game of relaxation and friendly competition that can become seriously meaningful"
Time - For as short or as long as needed! If you have more time or can’t decide whether to do the putting or chipping - how about doing both? With this you get to experience putting and chipping, and since they are right beside the clubhouse you don't even have to walk very far to get from one to the other! When using the putting green flat soled shoes are required. High heeled or shoes that may damage the putting green are not permitted. If you do not have flat soled shoes bare feet will be acceptable. 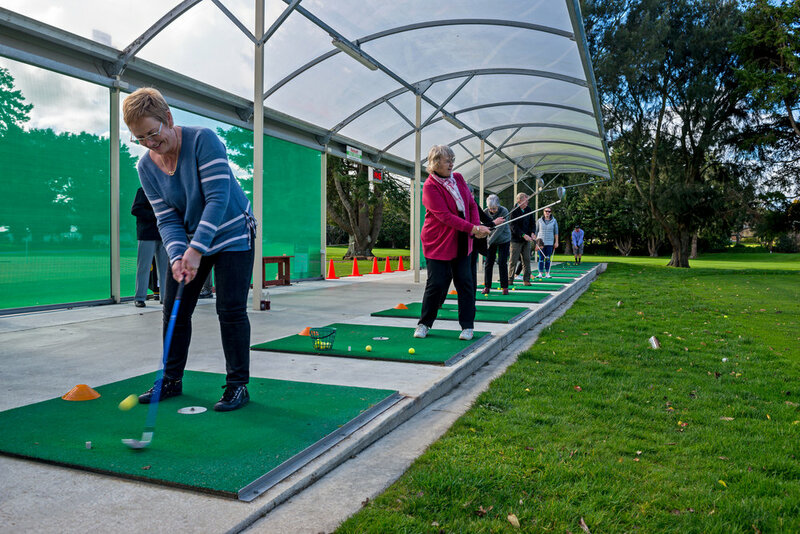 Due to the golfers playing the Manawatu Golf Course throughout the day the times available for each of these activities varies. Please ensure that you check for availability when booking for your event. Minimum charge of 12 people per activity.